A workshop group of more than 60 individuals representing more than 30 government, industry, academic and other organizations has found that a NASA-led manned mission to Mars is feasible if the space agency's budget is restored to pre-sequestration levels. Putting the first humans on the Red Planet would also require international cooperation and private industry support. "To be able to make it feasible and affordable, you need a sustainable budget," Carberry told SPACE.com. "You need a budget that is consistent, that you can predict from year to year and that doesn't get canceled in the next administration." While Carberry said that it is possible to launch a manned mission to Mars by the 2030s under pre-sequestration budget levels, a NASA-led human mission to Mars will probably never launch under current budgetary constraints, Carberry said. "We're not far off from what we need," Carberry said. "We just need to get back into a reasonable budget, which we're not in right now." President Barack Obama requested about $17.7 billion for NASA during his 2013 budget proposal, $59 million less than what the space agency received in 2012. "[NASA] funds are divided between various missions, directorates and centers," Carberry said via email. "Unless there was a MAJOR restructuring, it would be hard to accomplish a NASA-led Mars mission [under the current budget]. That said, major disruptive technology gains could always occur that could make it viable — we just can't count on that happening." The workshop group's plan hinges partially upon the availability of NASA's heavy-lifting rocket, the Space Launch System, and the space agency's deep space crew capsule, the Orion spacecraft. SLS and Orion are both in development now, with Orion's first unmanned test flight slated for later this year. The goal of sending humans to Mars is affordable with the right partnerships (international, commercial/industrial, intergovernmental, etc. ), commitment to efficiency, constancy of purpose and policy/budget consistency. Human exploration of Mars is technologically feasible by the 2030s. Mars should be the priority for human spaceflight over the next two to three decades. Between now and 2030, investments and activities in the human exploration of space must be prioritized in a manner that advances the objective of initial human missions to Mars beginning in the 2030s. Utilizing the International Space Station, including international partnerships, is essential for human missions to deep space. Continuation of robotic precursor missions to Mars throughout the 2020s is essential for the success of human missions to Mars. 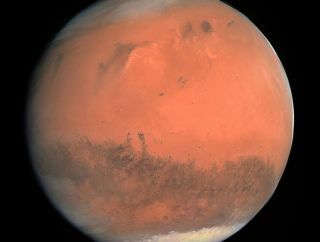 Carberry said that the experts are still not sure whether a long or short mission to the Red Planet would be best when launching the first manned mission to Mars. As a model of international collaboration and a huge undertaking in space, the International Space Station (ISS) could provide vital lessons about getting humans to Mars, Carberry said. The space station mission, which has been newly extended through 2024, is the best example of a consistent budget set forth for a huge project in space, he added. The $100 billion orbiting outpost could also be used to mimic parts of a mission to the Red Planet. Engineers could use the orbiting laboratory to demonstrate telerobotics and new spacesuits, and to work out possible problems that could arise on a trip to Mars. The workshop group also explored the idea of a mission that would bridge the space station and a manned mission to Mars. Agencies should consider such a bridge mission when moving forward toward a launch date in the 2030s, the workshop found. The bridge mission could be anything from NASA's ambitious plan to capture an asteroid and bring it into lunar orbit where astronauts could explore it, to a small and temporary station where astronauts can learn a little more about fending for themselves while in space. "When they're on ISS, they communicate [with Earth] every day — they can barely do anything without communicating with Mission Control," Carberry said. "They need to get out of the habit of that, and they know that." Private companies are planning their own trips to the Red Planet. Mars One is planning on sending a group of people to colonize the planet on a one-way mission in 2022. The company is also expected to send a lander to Mars in 2018. The Inspiration Mars mission, now slated to launch in 2021, will launch a couple on a flyby of Mars. This private mission might be a good precursor mission before a full Martian landing, according to Carberry. "There's an interesting window in 2021 where they would flip by Venus, which is relatively interesting itself," Carberry said. "If you have a crewed mission flying by Venus on the way to Mars, that's pretty impressive." If the Inspiration Mars mission does launch in 2021, it may help scientists put human boots on Martian dirt by the 2030s, Carberry said.